The list of over 10 million from President Barack Obama’s campaign has already received the call to host Economic Recovery Plan meetings in their homes and communities. Go to this link: http://my.barackobama.com/page/content/economicmeetings/. Since the Washington Post has nixed Book World and Sunday Source, that frees up more time for other kinds of reading. BTW the bill is 647 pages long. I do plan to attend one of the Economic Recovery House Meetings. Here are some questions that have been on my mind. 1. Where is the money coming from? – this may be the most difficult one to answer outside the Treasury Department. 2. What is good debt and what is bad debt? We’re going to have debt no doubt either way so you might as well qualify it. 3. What is the for real value of our “assets” or is there more hype value than substance? 4. Is “tax cutting” a new religion or an obsession? I know a few people who are doing financially well and have said they’ll pay higher taxes or forgo the tax cut if it helps the country. 5. HOLD MY EARRINGS!!! – TARP. When will a bank and finance accountability and regulation mob committee be installed? What should be the rules and regulations for TARP funds? Will there be cake in the Langston Room Sunday? These upper class colored people consisted largely of government workers, professors and teachers, doctors, lawyers, and resident politicians. They were on the whole as unbearable and snobbish a group of people as I have ever come in contact with anywhere. They lived in comfortable homes, had fine cars, played bridge, drank Scotch, gave exclusive “formal” parties, and dressed well, but seemed to me altogether lacking in real culture, kindness, or good common sense. Langston can’t talk too much smack about D.C. 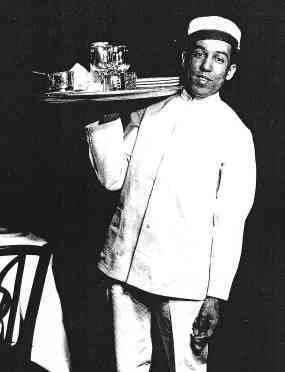 He was discovered as a poet in this city while working as a busboy at what is now the Wardman Park Marriott Hotel. He slipped his “Weary Blues” poem to Russian poet Vachel Lindsay. Langston also met his BFF Zora Neale Hurston in D.C. His reason for coming to D.C. may have been to take care of his mamma, but I bet he didn’t leave the way he came in. In fact, Langston, found the blues in D.C. and you left the city a poet. When I was in junior high school, I’d thumb through my sister’s copy of Black Magic, a coffee table book anthology of Black performers in music, dance, theater, film and television edited by Langston Hughes. I memorized the faces on each and every page. Black Patty, Florence Mills, Josephine Baker, Paul Robeson, Bert Williams, Lena Horne, Bill Robinson, Freddie Washington, Hazel Scott, Ira Aldridge. So much of my exposure to African American poetry and African Americans in the arts I owe to Langston Hughes. Welcome back to D.C. Langston and Happy Birthday. The Root.com published my article about my failed documentary project today. Sort of like Spike Lee’s “The Messenger” story minus the crying in the bathtub. I was on a bench on the patio of the Hotel Nacional in Havana. Maybe I’ll do a serial online of the people I met and the places I visited. Maybe all that research collecting was a way to justify my desire to travel. I love, love, love Asian cuisine. Vietnamese, Korean, Japanese, Indian, Chinese preferably Sichuan. The first Sichuan dish I ever had was Kung Pao chicken. I thought my mouth was on fire. I was in love. I’m no expert or purist about Chinese food. I just like what I like. The tough part for me is cooking it at home. I don’t even own a wok. Shameful. I’ve got the rice thing down, though. But the entree part is still pretty sketchy that is until Annie Chun came along. Using prepared sauces and box ingredients isn’t the way real cooks or foodies roll. I do keep staples that would resemble a respectable novice’s Asian cooking stash: short grain rice, basmati rice (sometimes jasmine), fresh ginger root, pad thai noodles, fresh garlic, industrial size bottles of soy sauce, corn starch, brown sugar, oyster sauce. Is this what fusion looks like? Annie Chun is Korean. But taking on the task of Asian convenience cooking at home that tastes (sorta) like take out will probably lift her to the status of Betty Crocker or dare I say Aunt Jemima. The exception being that Annie Chun is a real live person. But so was Aunt Jemima – Nancy Green was the spokesmodel’s name introduced at the 1893 Chicago World’s Fair. And Nancy Green worked in an office, not a plantation kitchen. And, Yes, I do buy the pancake mix and the syrup, but I still make my cakes from scratch. The Joy Luck Club exposed the myth about fortune cookies for non-Asians like myself. And guess what? I used to make my own fortune cookies at home. Is this exposing my obsession? Thanks to a post on racialicious.com, the clip below of Jennifer 8. Lee, reporter and author of The Fortune Cookie Chronicles, gives nearly a complete rundown of Chinese food as real American food in this almost 17 minute presentation, i.e. how often do you have American apple pie vs. Chinese food. There are times while I’m picking up my take out, I catch the restaurant owners on their break eating their own food. It never looks like the food in my black plastic covered plate. It even looks tastier. I’ve been told, if you really know how to order from a Chinese food menu, you can get the real Chef specials. All this to say, it’s already a Chinese New Year. The year of the Ox. Beijing has already launched the fireworks. 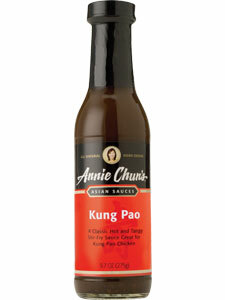 We could use a little Ox-idizing right now – calm, hard work, resolve and tenacity…and of course, a dash of Kung Pao. 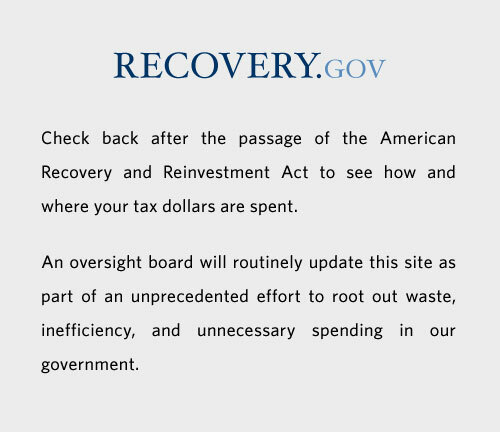 Note: The recovery.gov site is still under construction as of 8:25 am this morning. 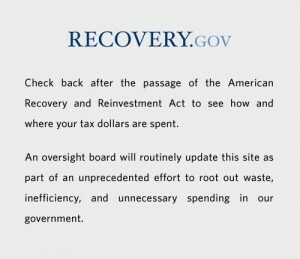 OpenCongress’s blog has more information about the mandate for creating the site where everyone can get information and monitor government spending from the stimulus package.